You may have heard about our powerful, all-in-one instrument the Analog Discovery 2, and wanted an opportunity to try it out. There’s only so much you can learn from videos and tutorials, and it can be difficult to fully understand without actually taking the theory into practice. What you may not be aware of is that even without a device you can still have the opportunity to test drive the software yourself. 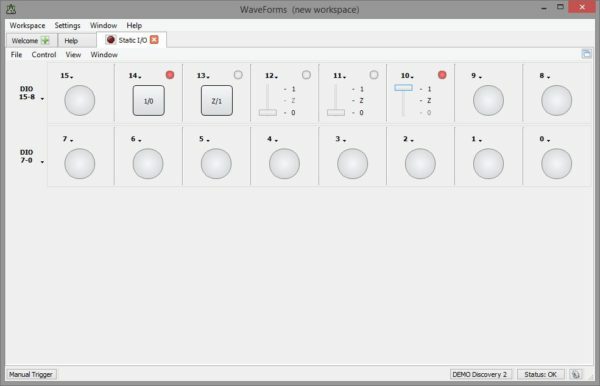 That means you can explore the tools, features and setting of WaveForms 2015 on your Mac, Linux or Windows machine. If you have downloaded Waveforms 2015, you should be able to follow along. If you haven’t, click this link , enter your email, to get a copy of it (plus, take advantage of a newsletter promotion)! 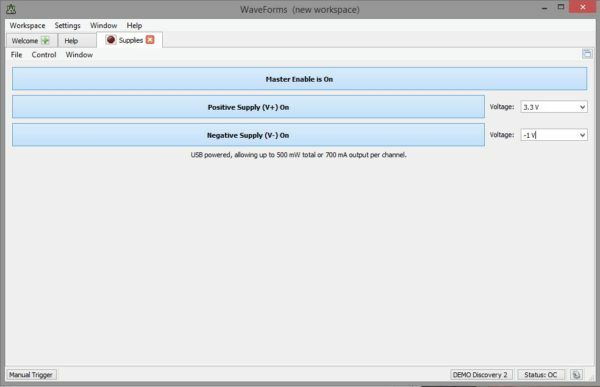 When you open the WaveForms 2015 Device Manager (which you can hear about more in my last post), you will see 3 options and what they are depends on if you have a device plugged in. 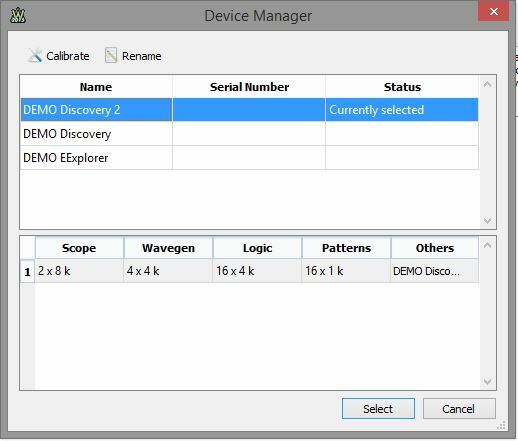 If you don’t have a device plugged in, these options will show: Demo Discovery 2, Demo Discovery, and Demo EExplorer . 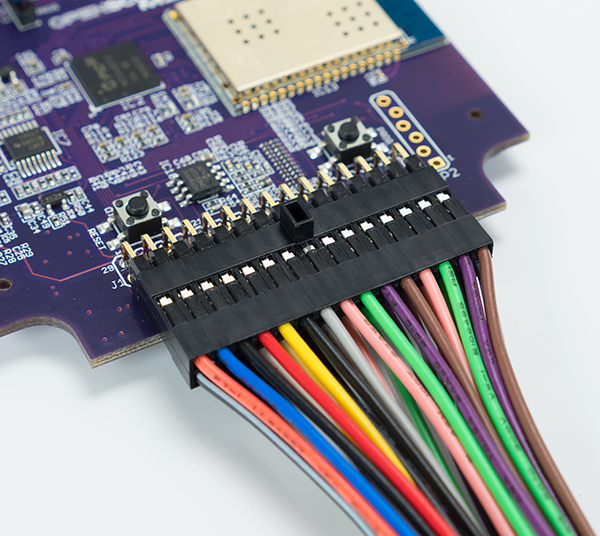 Since each board has different features, Demo Mode shows the differences in user interfaces. For example, shown below is the power supply interface for the EE board, Analog Discovery, and Analog Discovery 2. You can see a drastically different interface for the EE Board and the variable power supplies on the Analog Discovery 2. The power supply interface for the EE Explorer, Analog Discovery, and Analog Discovery 2, from left. 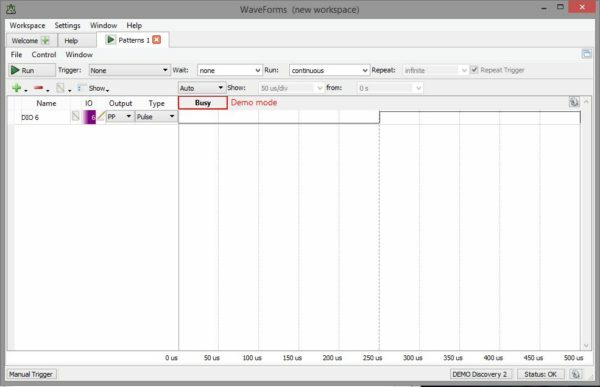 Demo mode allows you to explore WaveForms 2015 as you would use them with one of the three Digilent devices. This way you can see all the features and tools before you make a purchase. I have highlighted some of these useful features below! Most of the features are pretty clearly laid out in the Graphical User Interface (GUI). However, WaveForms 2015 has a lot of tools and customization. For simplicity some of those have been tucked away in additional menus. You’ll find these hidden gems if you click on the green arrow or gear icons. I have highlighted some of these features below, and while looking through them you may notice a lot of drop boxes. In addition to being able to select the preset values, you can also edit the values in most of the drop boxes. The oscilloscope in Demo mode. You can test out changing the time-base, ranges of both channels, math channels, cursors, and more; all while Demo mode simulates a sine wave on channel 1, and a square wave on channel 2, or the waveform generator output. 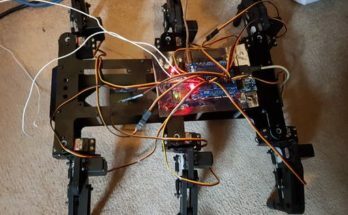 You can display the signals within your project, and calculate rise time, amplitude, frequency, see signal quality and more. 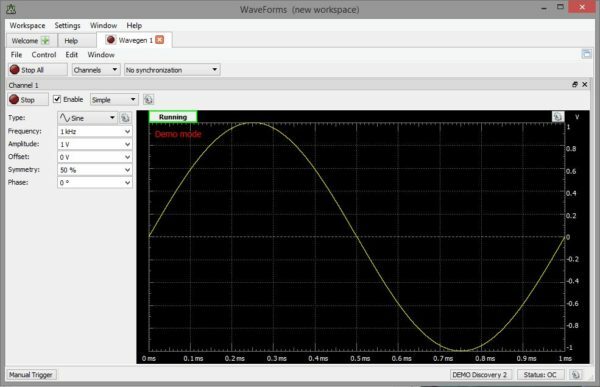 The waveform generator running in Demo mode. 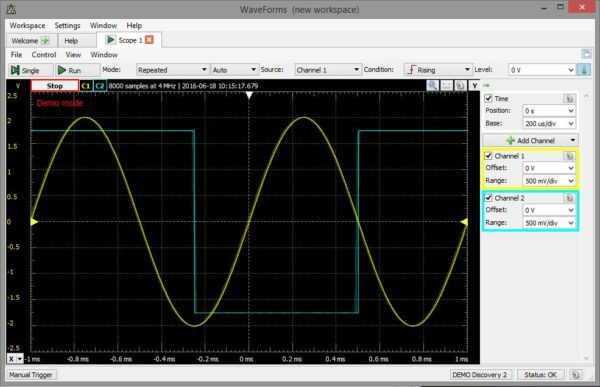 This allows you to explore both the set waveforms you can generate, and arbitrary waveforms that you can upload. 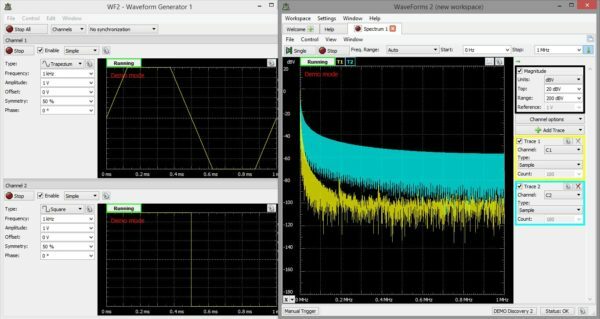 When you open the waveform generator and oscilloscope you can see both of them functioning at the same time. 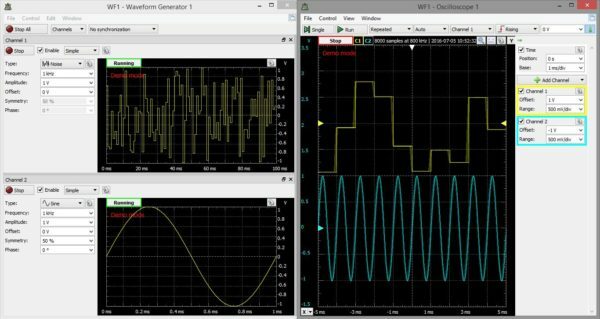 The output of the waveform generator will be displayed on the oscilloscope, as if they were connected together. Make sure you try out the math channels. The power supplies in Demo mode. This image displays the power supplies in the Discovery 2 demo mode. There are drop down boxes for set voltages, and the ability to enter a variable voltage. 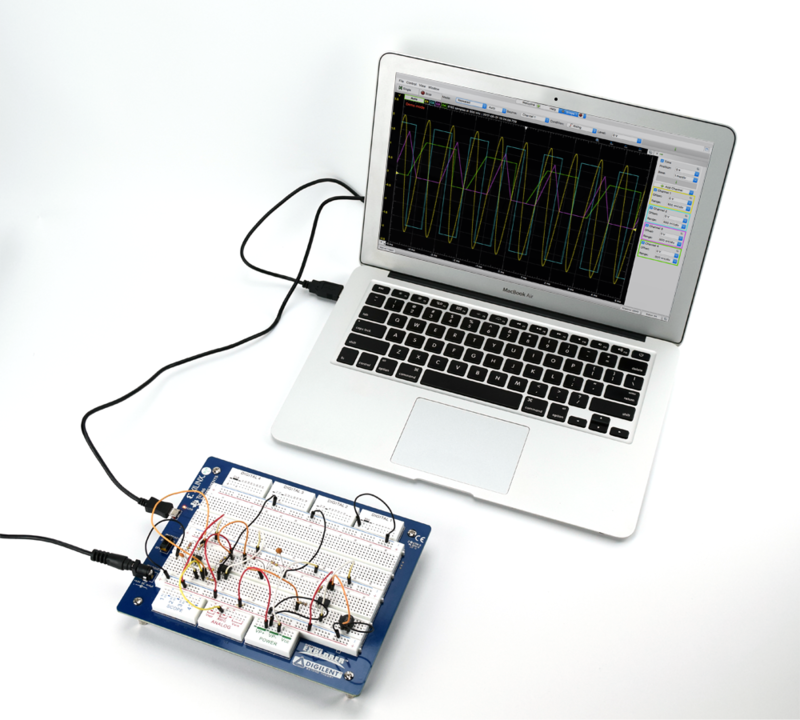 You can power both analog and digital projects at a variety of voltage levels. 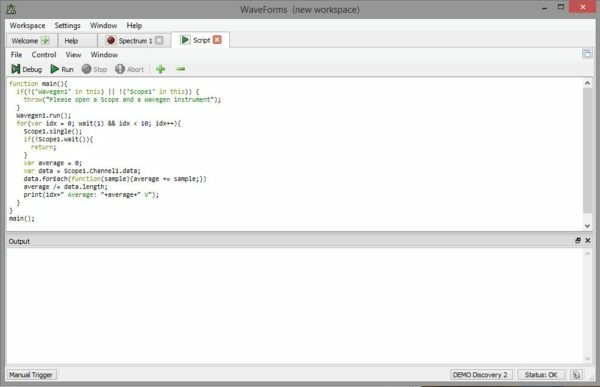 The pattern generator in Demo mode. You can add digital patterns and test what you can create. There are built in patterns that can be utilized, such as a pulse, clock, counter and more. The pattern generator and logic analyzer. 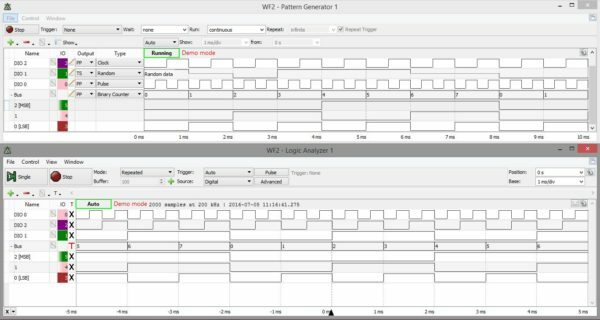 When run in demo mode the output of the pattern generator displays on the logic analyzer. You can use either Digital I/O, displaying the waveforms, or a bus analyzer to decode the data the signals are sending. Static I/O demonstrating several of the options. You can simulate buttons, switches and an LED. The network analyzer in Demo mode. In Demo mode the network analyzer shows an ideal high pass filter. Instead of scoping each response at individual frequencies and plotting the response, you can do a frequency sweep of your filter to get the entire response. 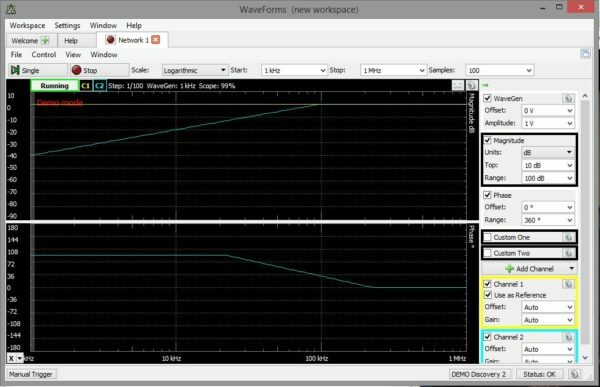 In Demo mode the spectrum analyzer shows the result as if the waveform generator channels were it’s input. The script window in Demo mode. The script editor allows you to create custom tests. 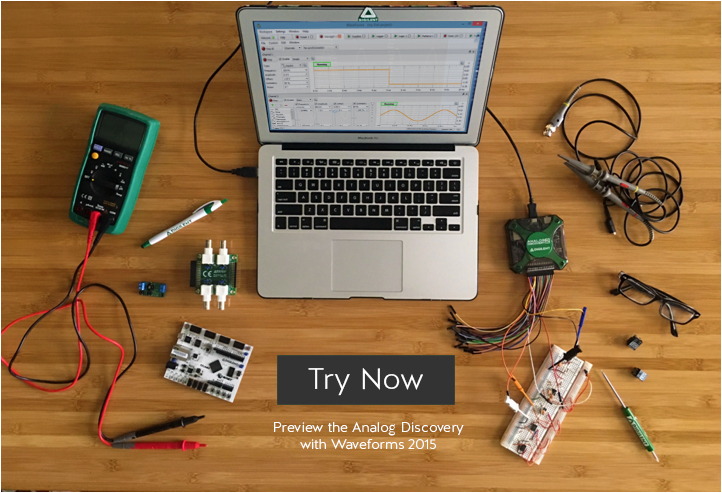 Download WaveForms 2015 or, go to the special , “TRY WAVEFORMS” page, enter your email (to get a free coupon for mini grabbers and a power supply) and have fun test driving!